How many Facebook users are there in the Netherlands? In July 2014, it was forecast that that 10.5 million people would use the social media platform in 2018. According to data measured in 2019, however, Facebook had 10.1 million users. Interestingly, the number of users in 2018 was around 300,000 higher than what calculations predicted, meaning that the Silicon Valley company had lost approximately 700,000 users in the span of just one year. 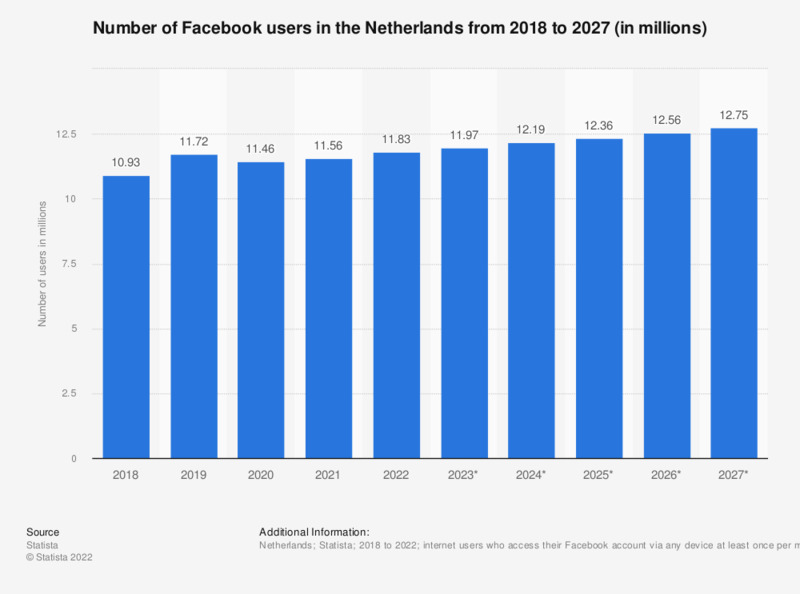 This decline was due to public criticism on Facebook’s data policy and, consequently, privacy concerns, a sensitive topic in the Netherlands. News coverage on the Cambridge Analytica scandal in 2018 led to a public appeal from popular television presenter Arjen Lubach to people to delete their Facebook account. Whether or not this appeal lead to the actual decline is unclear. Millennials, indeed, indicated they spent less time on the social media platform, citing too many advertisements and too little activity from their friends. Compared to other European countries, Facebook was still relatively popular in the Netherlands. The share of the country’s population which used the social network was higher than that of France, Spain, Italy and Germany, but lower than in Belgium. An article with facts and figures covering Facebook in Belgium, Luxembourg and the Netherlands can be found here. Internet users who access their Facebook account via any device at least once per month.